Tomato juice is the official state beverage of Ohio, according to chef and food researcher James T. Ehler of FoodReference.com. Ohio residents are on to something. Tomato juice, which tastes good hot or cold, can help you reach your weight loss goals if you know a few things about it and know how to pick the right kind. Tomato juice can help you lose weight if you drink it instead of higher calorie beverages. For example, 12 fluid oz of tomato juice has 60 calories, according to the Fat Secret food nutrition information database. Tomato juice is also a good source of calcium, vitamin C, and iron, which make you feel good and therefore less likely to cheat on your diet, reports Fat Secret. By contrast, the average sugar-sweetened soda has 150 calories and no nutrients, according to TeensHealth. 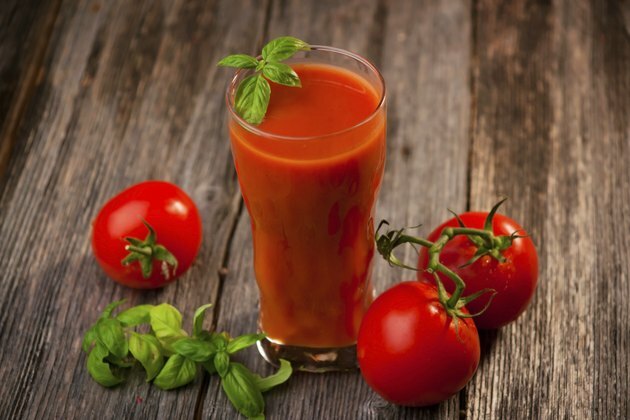 Tomato juice can help your body get the water it needs, and that helps you lose weight. When you're dehydrated, your kidneys compensate by hoarding water, causing you to hold onto water weight, which you should be getting rid of when you use the restroom, according to Andrea Wenger Hess, a nutritionist at the University of Maryland's Joslin Diabetes Center. Tomato juice may help you deal with food cravings. Foods with sharp, acidic tastes, including tomatoes, seem to "overwhelm" the taste buds, which might help you feel more satisfied and avoid eating when you're not hungry, according to Selene Yeager's "The Doctor's Book of Food Remedies." For just this reason, Bernice Patterson, a group leader for a popular group-based weight loss program, encourages her members to sip tomato juice or munch on grape tomatoes when they crave sweets or fatty foods. Be aware that tomato juice is not as good for you as whole tomatoes. Juicing removes the fiber from fruits and vegetables, according to the American Cancer Society. That's a problem because foods with high fiber take longer to digest than foods lower in fiber, which in turn helps you feel full longer. So enjoy your tomato juice but don't use it as a substitute for whole vegetables. Some tomato juices are high in sodium. For example, a 1-cup serving of one popular brand has a whopping 750 g of sodium. Not only does this make some tomato juices dangerous for those on restricted-sodium diets, but excessive sodium consumption causes your body to retain water, which causes weight gain, according to the Mayo Clinic. Fortunately, low-sodium tomato juices are available in supermarkets.